From the French for “sour wine,” vinegar includes a diverse family of culinary products produced through the process of fermentation. In the Western world, the most widely consumed vinegars are derived from grapes and apples. Grape-based vinegars come in several varieties--balsamic, red wine and white wine, for example--and offer distinctive properties that broaden their usefulness to applications well outside the kitchen. Check with your doctor before beginning any regimen of self-treatment. Red wine vinegar contains a number of antioxidants that can help protect the body from metabolic syndrome, a collection of conditions that in combination increase your risk for diabetes and cardiovascular disease, according to MedlinePlus. Cal Orey, author of “The Healing Powers of Olive Oil,” identifies the vinegar’s health-promoting antioxidants as quercetin, polyphenols, tannins, proanthocyanidins, catechin and flavonoids. Quercetin helps prevent diabetes by slowing the metabolism of insulin, says Orey. Polyphenols and tannins are helpful in inhibiting clotting factor and platelet aggregation, both of which are serious risk factors for heart attack and stroke. Tannins also help increase blood levels of high-density lipoproteins, the so-called good cholesterol. The proanthocyanidins in vinegar retard the formation of plaque on artery walls, and catechin and flavonoids work with one another to keep cholesterol levels healthy, according to Orey. Talk to a medical professional to determine whether this remedy is appropriate for you and your specific health conditions. Grape-based vinegars generally contain between 5 percent and 10 percent acetic acid, which studies have shown is a natural appetite suppressant. Nutrition researchers at Sweden’s Lund University studied the effects of vinegar of varying acetic acid levels on test subjects’ glycemic and insulin responses, and their sense of fullness after a meal consisting solely of 50g white bread. In their findings, published in the July 2005 issue of the European Journal of Clinical Nutrition, the researchers reported that glucose and insulin responses were lowered and satiety increased in direct proportion to the level of acetic acid in the vinegars. Check with your doctor before using this or any other home or herbal remedy. 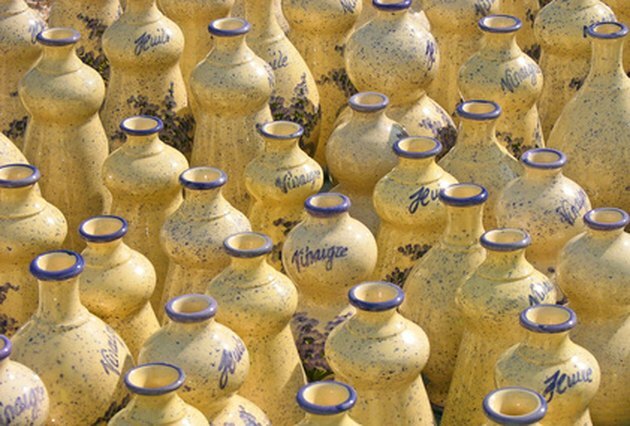 The Vinegar Institute is an international trade association that represents most of the world’s major producers of vinegars, many of which are grape-based. The institute’s website offers a number of helpful remedies using vinegar, including a few for minor skin irritations. To soothe the pain of a bee or jellyfish sting, douse the affected area with grape vinegar. It also heads off itching if applied in a timely manner. Promptly apply chilled vinegar to a skin burn to prevent the formation of blisters; vinegar also can relieve the pain of sunburned skin. If you’re troubled by dry and itchy skin, soak in a warm--not hot--bath to which 2 tbsp. grape vinegar have been added.